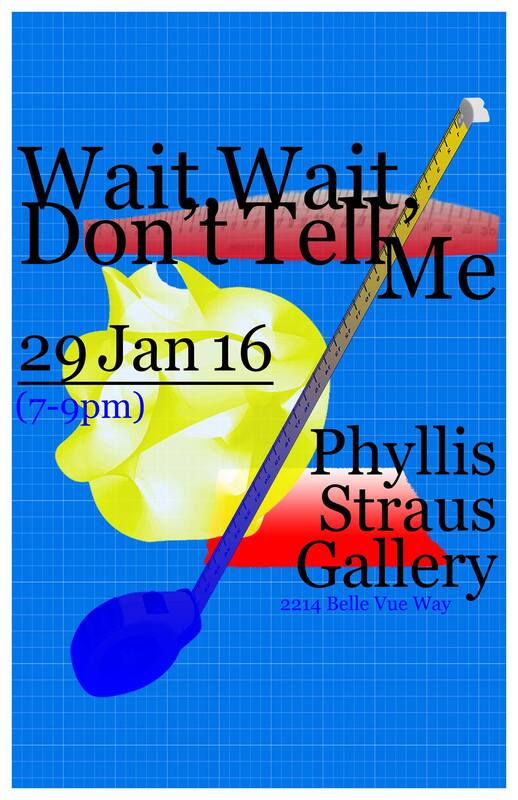 The Phyllis Straus is excited to announce a call for submissions for a group exhibition, Wait, Wait, Don’t Tell Me. This show is open to all BA, BFA and MFA students. We ask that all submissions be brought to the Phyllis Straus closet (at CAB) with the artists name, email (.fsu, preferred), telephone number, title, dimensions, and materials. In addition to that, please be sure to include a phrase that is under twenty words. This phrase can be something that you might find yourself repeating or, a quote or, something someone has said to you or near you – anything that has been a recurring thought or has resonated with you as a person or as an artist (or both). This is necessary to be included in the catalog. If you cannot place your work into the closet, please email the information needed and a photograph to either Christopher Watkins (csw14c@my.fsu.edu) or Brooke Huseby (bhh13@my.fsu.edu). ALL SUBMISSIONS ARE DUE BY 7PM, WEDNESDAY, JANUARY 27. Notifications regarding acceptance will be sent out on the following Thursday morning. The show opens on Friday, January 29, 2016 at 7pm. A limited number of catalogs will be available upon a first come-first serve basis. We hope you can submit to our first show of the semester and to join us for our reception. See you soon!